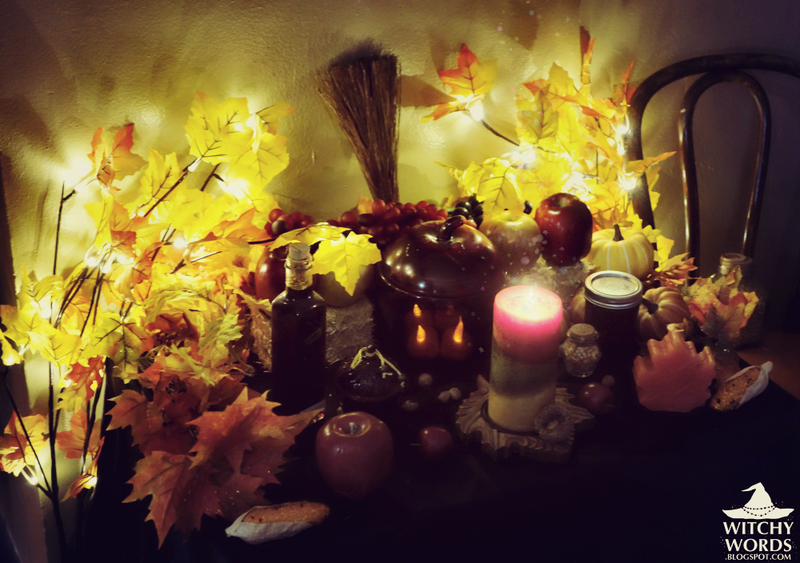 This post will cover the Mabon / Autumn Equinox celebration and ritual by the Circle of Northern Fountains. In advance, I'd like to apologize for this post coming so incredibly late. My husband and I officially moved on September 20th, so things have been absolutely hectic. So hectic, in fact, that my altar for this holiday was a little rushed. 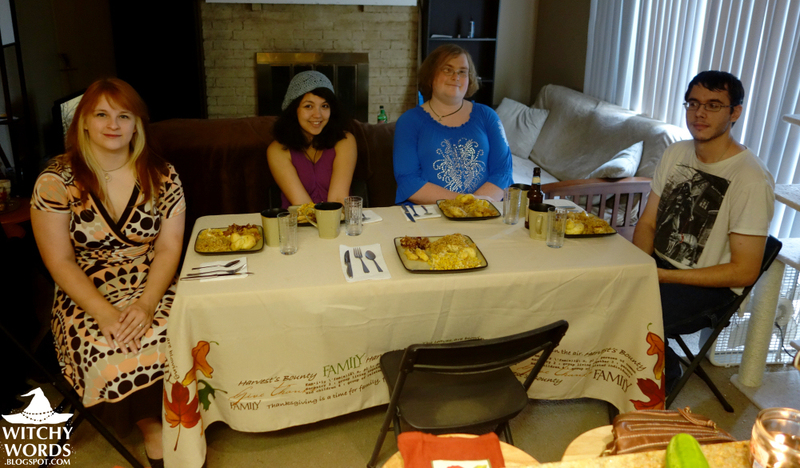 My husband, our roommate and fellow CNF member Tony and I literally said "Hey, does this look Mabon-y? Sure. Throw it on the altar." It's certainly not the usual care I take in putting together altars and not the kind of respect the sabbat deserves. However, we did the best with what we could given the time frame. 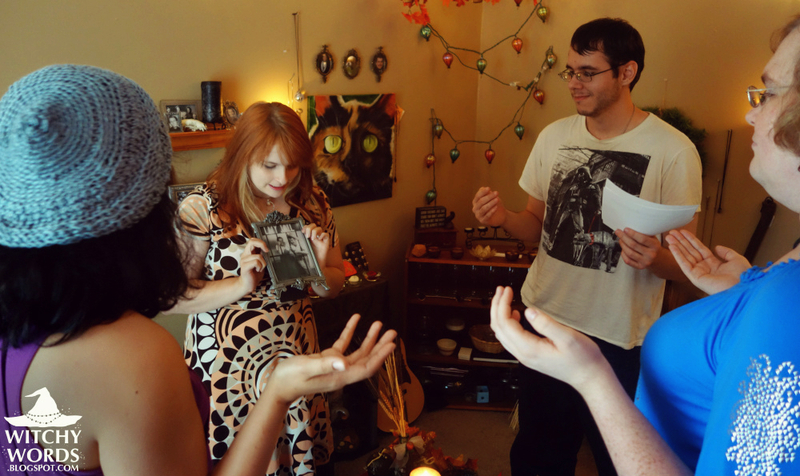 While my altar may have been rushed, the sabbat celebration and ritual, written by Tony, certainly wasn't. 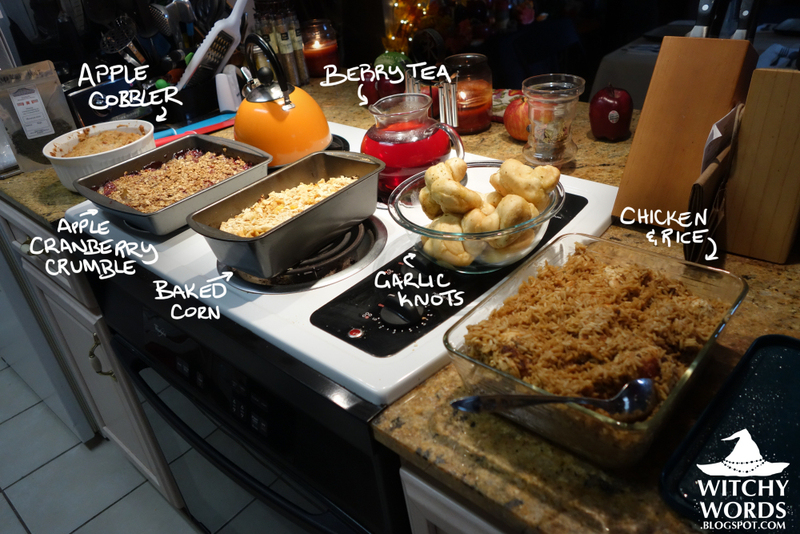 Tony began our ritual as usual with a potluck feast. Just like August Eve, my mom gave us apples and cucumbers to add to our dinner! 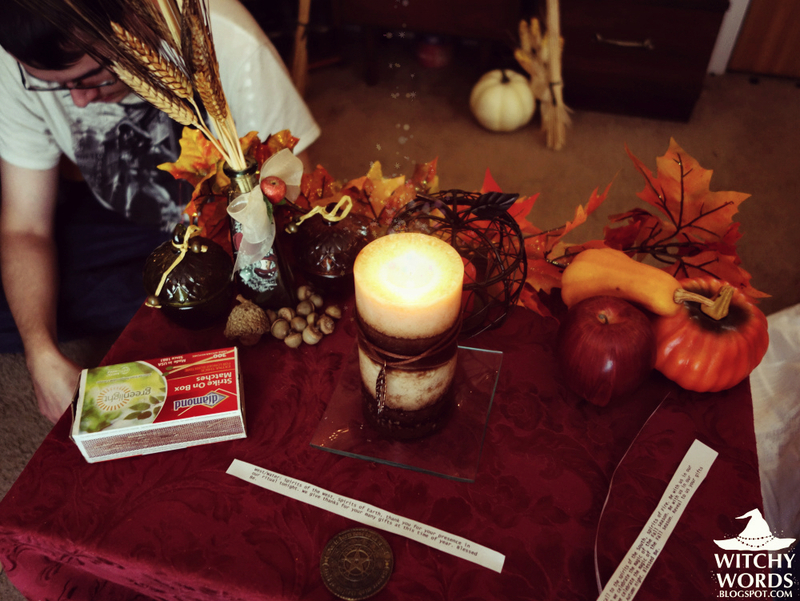 We then lit my Autumn Equinox altar and headed into the spiritual room for ritual. 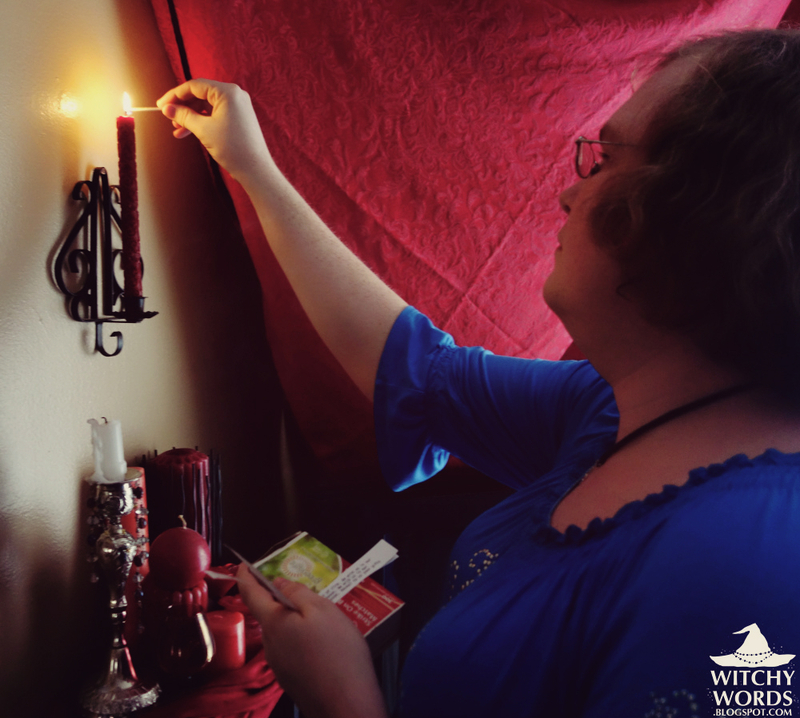 We began the ritual by calling upon the elements, reciting "Blessed Be" after each candle lighting. 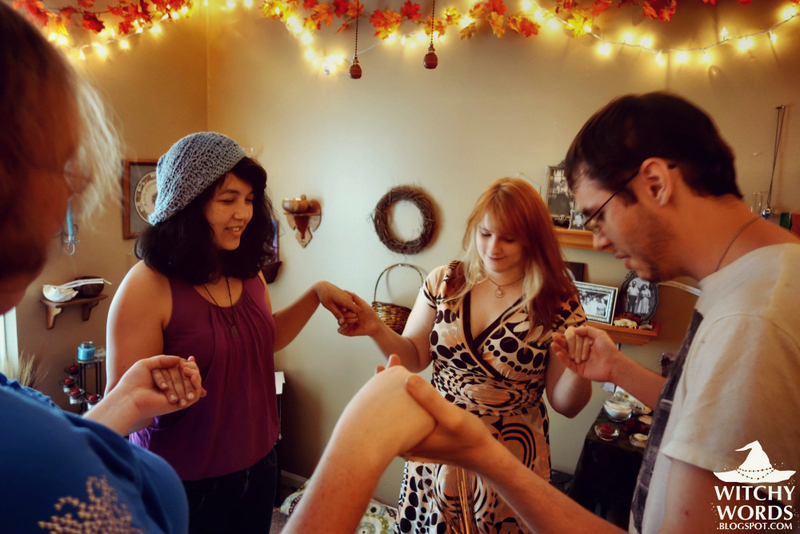 We then turned to the center and held hands to officially cast the circle. Tony then asked us to call upon deities, spirits, energies or ancestors we associated with harvest. Deities called upon included the Morrigan and Persephone and Demeter, while ancestors included my grandparents who did farming to help make ends meet, pictured above. The meat of Tony's ritual involved creating a bind rune to help us with the changes occurring in our lives as we shift from the lighter part of the year to the darker part. While I could create a completely different blog entry on bind runes, the general idea is to take a few runes of particular meanings and skillfully combine them to create a rune with a special meaning to you. This is typically done with Norse runes, but could likely be done with just about any type of rune. Tony and I specialize in the Elder Futhark, so that's what we used in ritual. 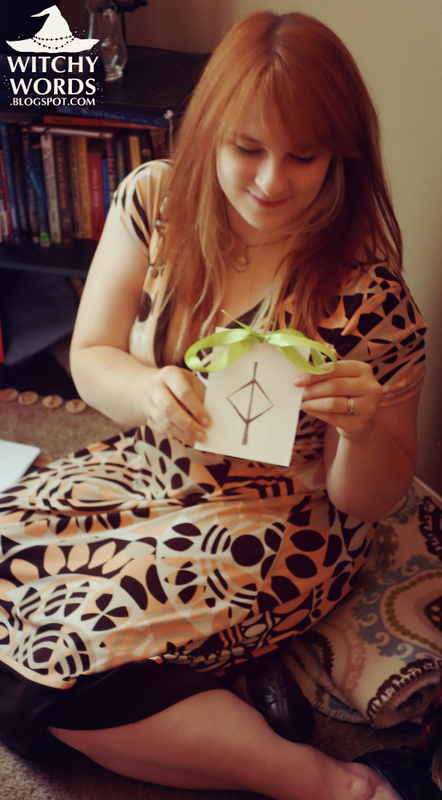 For each person, I asked what they were looking for and chose a rune with similar meaning, explaining anything they may need to know about each symbol they received. We then took a portion of card stock to sketch out potential bind runes and another smaller portion to create our official bind rune. Everyone's looked completely different. 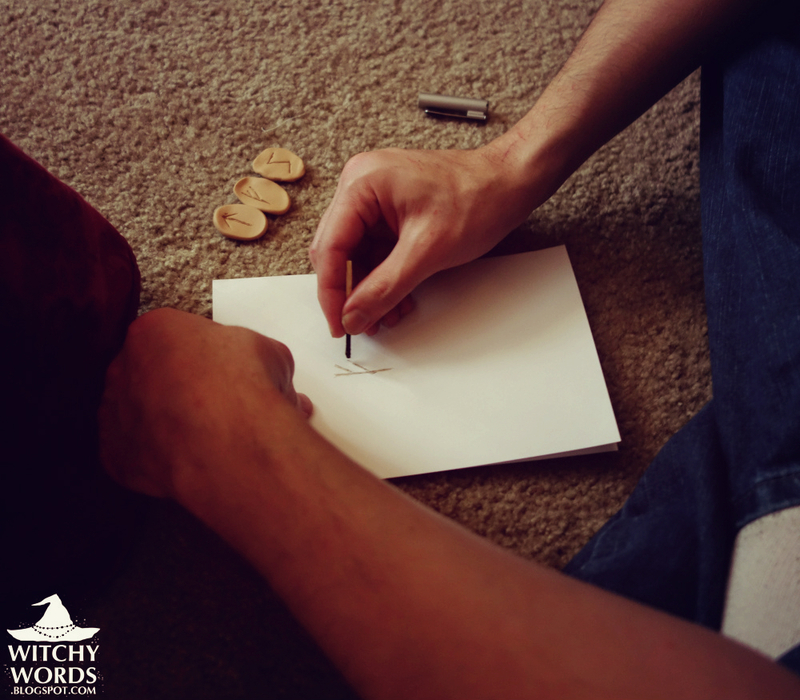 Tony sketched his out using burned matchsticks on a small 2"x2" piece of card stock while Kolika used nearly the entire page to create a bind rune with a circle around it. Hers included the meanings of each rune she used written out to form the individual runes that made up the bind rune. I thought this was particularly effective as she's not as familiar with runes. You can see mine above. Because my bind rune is for home protection, I added a green ribbon tied to mine. Once the runes were created, Tony read a harvest poem and we closed the circle by thanking the elements. 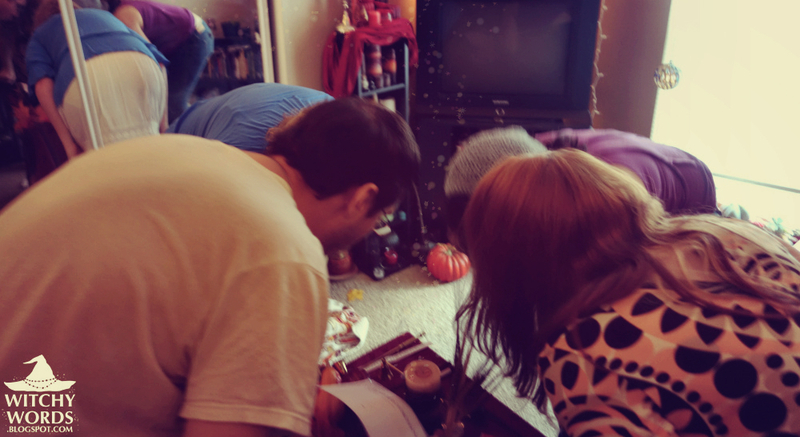 We then officially ended ritual by opening the circle. Merry meet, merry part and merry meet again! 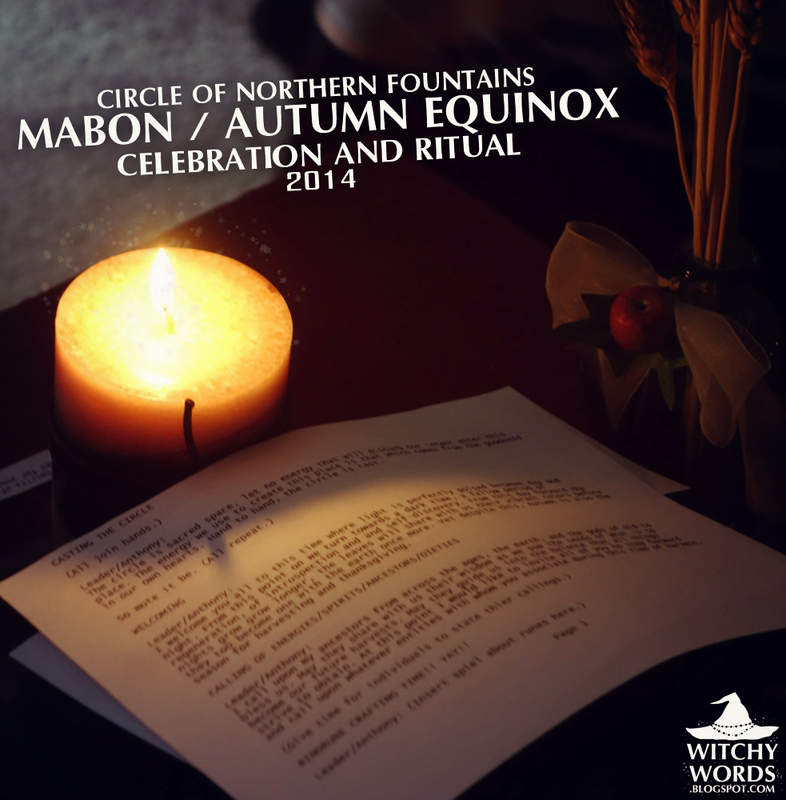 And that concludes the Circle of Northern Fountain's Mabon / Autumn Equinox ritual for 2014! 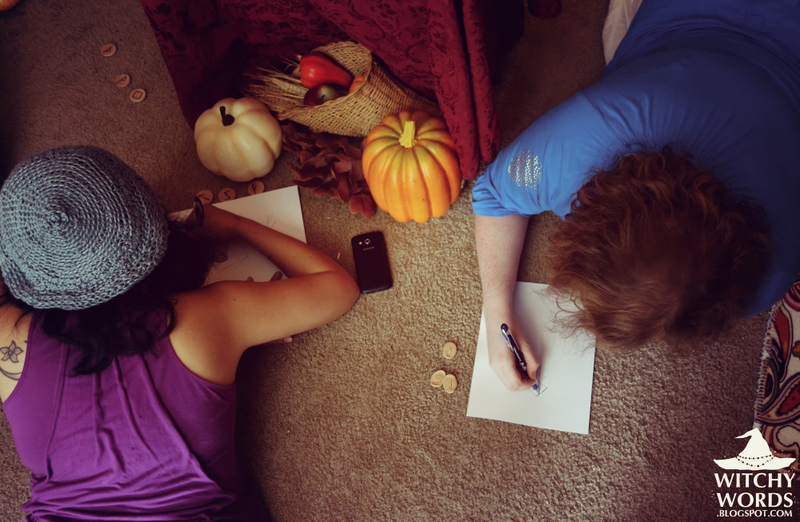 We sincerely hope you had a fantastic equinox! 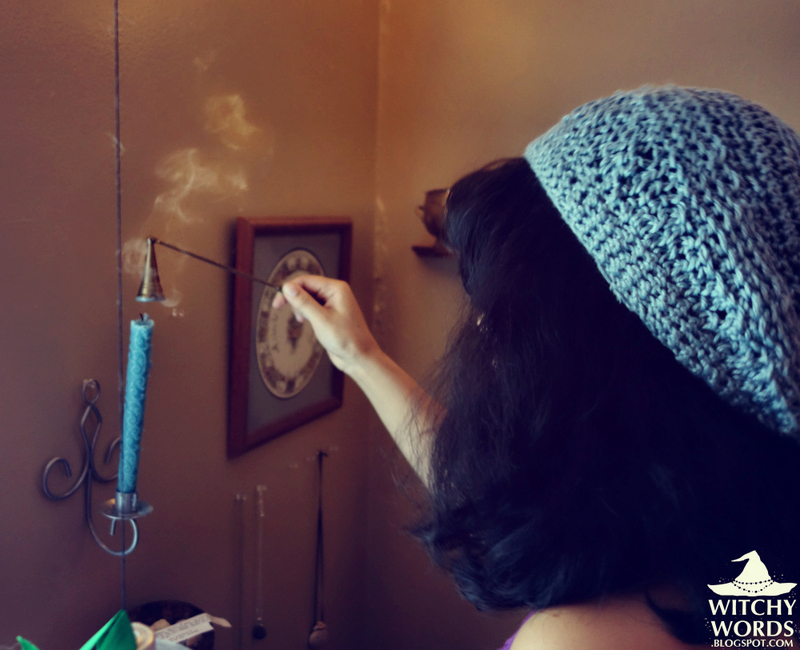 Coming soon: Our house cleansing ceremony! 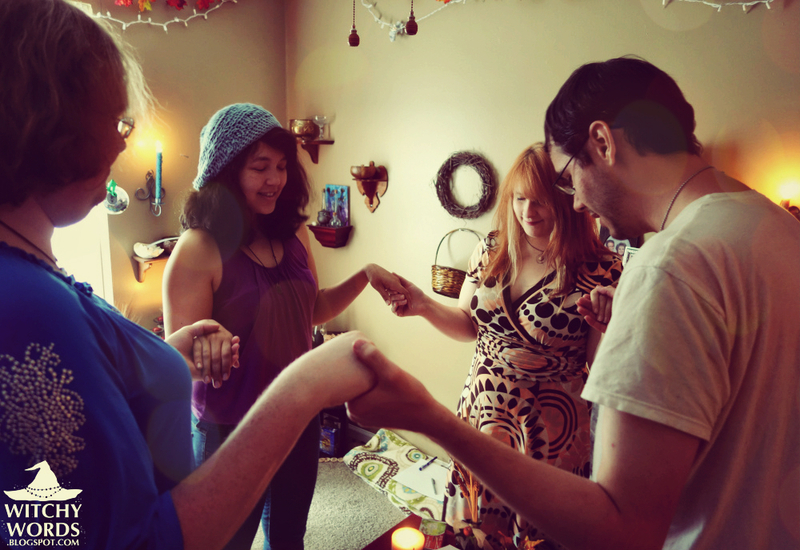 To see the previous sabbat, August Eve / Lammas / Lughnasadh, click here! What a beautiful gathering. I am glad to hear that you guys have moved. I sincerely hope that your new home is more welcoming, and not plagued by so much negativity like the last place was. Thank you so much! We officially moved on the 20th and our lease ended on the 25th, so the apartment was history as of Thursday of last week. The new house is so wonderful! I'm absolutely in love. 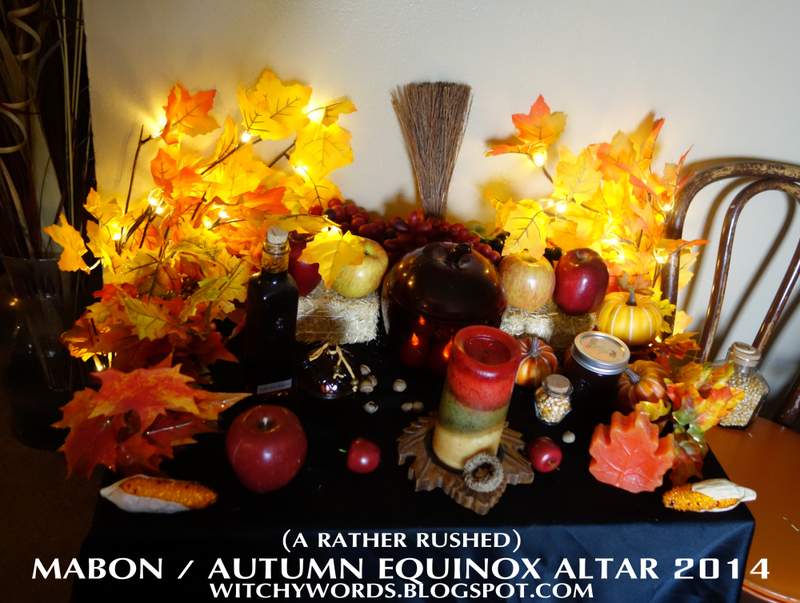 I plan on posting a more detailed update tomorrow, but I felt like I should post up our Mabon celebration first.